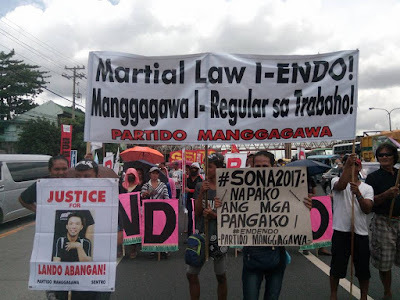 The labor group Partido Manggagawa (PM) slammed the SONA of President Rodrigo Duterte for failing to tackle the delivery of campaign promises including ending contractualization. Tomorrow, members of PM along with other groups from the labor coalition Nagkaisa will troop to Congress to call for the passage of the Security of Tenure bill. “Duterte’s SONA—minus the stories and curses—was all about death and taxes. People will die. Filipinos will be taxed. Taxes will be used for the war on drugs and the armed forces instead of for social services. In contrast, the SONA’s silence on endo and other reform promises was deafening,” stated Rene Magtubo, PM national chair and spokesperson of Nagkaisa. More than a hundred workers will assemble at the gates of Batasang Pambansa at 11:00 am tomorrow to push for the enactment of a law to prohibit all forms of contractualization. It will also be an opportunity for labor to air its reaction on the SONA. “Instead the narrative of whether promises were delivered were overshadowed by Duterte’s rambling rants against his critics, principally human rights advocates and the mass media. Indeed the rants were an entertaining distraction from the embarrassing topic of undelivered promises. Paradoxically only China was unreservedly praised,” he added. Magtubo insisted that workers were left with unanswered questions after the SONA. “So has the promise of change been delivered? Obviously not, but why? After the hours-long stories, curses and boasts, how will the lives of the workers and the poor be changed permanently? Of these, there were no answers,” he argued.